TV's stuttering megastar is ideally suited to appear in a computer game - well he is computer generated after all. But he doesn't actually crop up though until the end of this one because your task as Edison Carter the TV reporter is to rescue him from the clutches of Network 23. 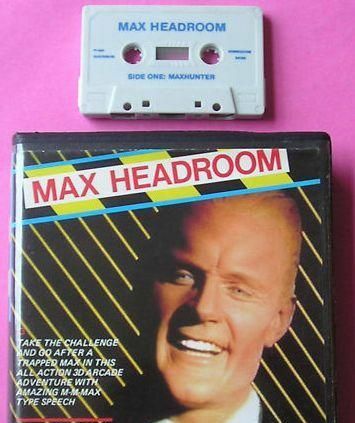 The game is based on the original TV play, in which Max is created, and draws heavily on the scenes involving the lifts in the Network 23 building. 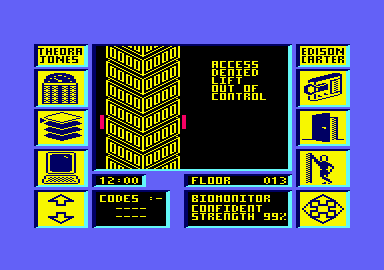 The screen is split into three areas: the sides are occupied by eight icon menus, the bottom third of the screen is an update panel and the main central part of the screen is where the action is. This is where the building, rooms and puzzles are shown as you move through the game. 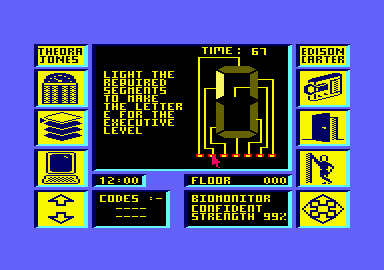 The first task is to get into the top 11 'executive' levels of the building by forming the letter E on a digital display. One mistake on this screen and the lift can be sent out of control to any of the 211 floors. Once on the executive level you have to find the four codes that will get you into the president's level and then the code to the lab where Max is being kept. Each floor is accessed by the digital readout screen and once there, a number of icons can be used. Using these you can access the lifts, gain control of the doors on a floor, check the floor using security cameras, restore your energy and search rooms. Once you've gained control of a level the offices on it can be searched for codes but you'll be constantly harassed by security robots and the oven more deadly Breugel and Mahler. These sap energy if they touch or shoot you and cannot be disposed of, just avoided. 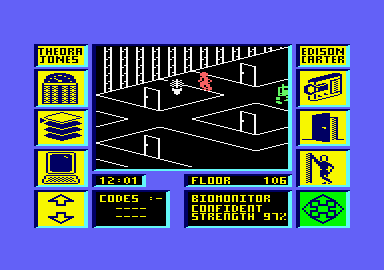 The graphics for the floors are very simple and the main stick figure does not look very impressive, but the sound effects and tunes throughout the game are very effective. The game is basically just a matter of running around searching rooms and trying to stay alive. This doesn't make for particularly thrilling action but may still present a tough challenge. Really very dull indeed. 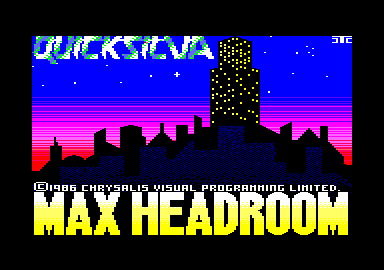 The puzzling is trivial, the graphics are weak and all the floors are the same. Why do all the great licensing deals produce lousy games? 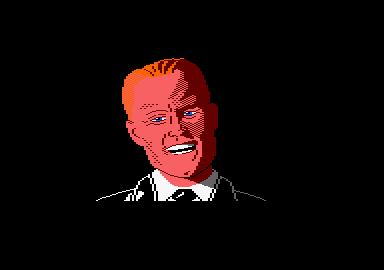 » Topic: Cheats, pokes ou solution pour "MAX HEADROOM"